Doesn’t it look exquisite? And can you see the lovely colour? No? Oh well… that might be because the covers are stacked in a box somewhere and wrapped in ten layers of plastic!!! And you know what tops the chart? You have to be two people to put it together. In case you didn’t know… I live alone. My family is in another country. Well done, Em! One would think that the furniture store could have warned me. 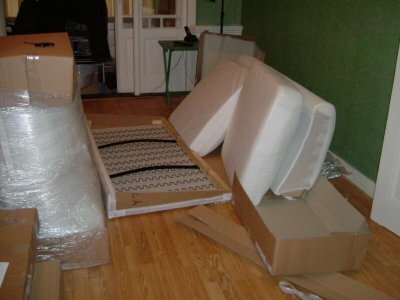 Oh, by the way… We’ll send your couch in bite-size. Who will now become a regular visitor here at Idle Thoughts. Well, I’m not entirely certain… But I’m leaning towards bribing some unsuspecting friend to come and help me. But I’m sure it’ll look really good once it’s put together… I hope!